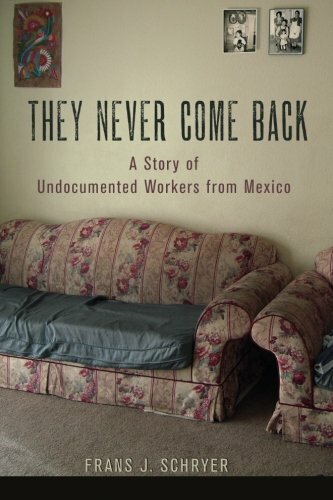 In They Never Come Back: A Story of Undocumented Workers from Mexico anthropologist Dr. Frans Schryer shares the migration experiences of indigenous people from the Alto Balsas basin in the state of Guerrero. His goal is to provide readers with a better understanding of the everyday struggles and contributions to the American economy of these so-called illegal aliens and thereby underscore the urgent need for reform of a dysfunctional and hypocritical U.S. immigration policy. Dr. Schryer is in a prime position to paint an empathetic portrait of these men and women who have slipped across our southern border to labor in the shadows and keep the wheels of American commerce turning in jobs that we do not want to do, for minimal pay and few benefits. He has conducted ethnographic field work in rural Mexico for over four decades and speaks Nahuatl, the language of the ancient Aztecs and the mother tongue of his informants. This longitudinal perspective allows the author to illustrate how the migrant experience has changed significantly over the past two decades for Mexicans on both sides of the border. Up till the mid-1980s when handicraft production in the Alto Balsas provided a viable alternative to peasant agriculture, most migrants traveled a circuit within Mexico to sell their wares. A much smaller number opted to work for wages in the United States, sending back remittances and returning home on a regular basis through a relatively porous border. In both categories, the vast majority of migrants were single men. After the signature of the North American Free Trade Agreement (NAFTA) in 1994, which opened up the Mexican economy but drastically decreased employment options, the migrant exodus accelerated until the events of 9/11 and the subsequent militarization of the border slowed the stream. Nowadays, more people migrate as domestic units, albeit often incomplete as young children may be left behind with relatives, while it is not uncommon for single women to make the increasingly perilous journey north to “the other side” order to do their bit to support the family at home; however, few migrants go back and forth anymore. Though most migrants still make an effort to maintain ties to home, even building a house in their village or paying relatives to assume public service obligations traditional in closed corporate indigenous communities, family separations may be extended or essentially permanent. And with time and distance inevitably community affiliations erode. Yet even these highly acculturated migrants live in constant fear of detection, as it becomes increasingly difficult to obtain fake documents that will pass even in the underground economy, and xenophobia flourishes especially in border regions. Dr. Schryer’s book also stands out as a conscious attempt at a piece of public anthropology, which eschews the exhaustive citations, complex theory and associated technical jargon academics present to peers for straightforward communication of research results to a broader audience with the intention of opening up public debate on immigration. In the main, he achieves this via an engaging narrative which relies heavily on direct quotes from informants; however, there are so many extracts from so many interviewees that at times it is hard to keep the cast of characters straight. Also, it would have been nice to get to know at least a few of the informants in more depth as individuals rather than as fragmented voices weaving in and out of thematic chapters. The only other detraction is that the book title They Never Come Back is rather confusing at first as most migrants from the Alto Balsas do, in fact, return for visits. Rather, the title is a commonly heard regional expression in Nahuatl which conveys a feeling of frustration, loss, and disappointment experienced by both the older generation left behind and the younger generation who must sever their roots to live in America. It is not that migrants never come back, it is that they can never come home enough to keep families, cultures, and hearts whole. An immigration policy which grants work permits as necessary and stops conflating immigration with threats to national security seems long overdue for both humanitarian and economic reasons.